Here, we describe a protocol to analyze the phenotype of regulatory T (Treg) cells isolated from naïve and chronic lymphocytic choriomeningitis virus-infected mice. In addition, we provide a process to evaluate the suppressive activity of the Treg cells. Park, H. J., Oh, J. H., Ha, S. J. Phenotypic and Functional Analysis of Activated Regulatory T Cells Isolated from Chronic Lymphocytic Choriomeningitis Virus-infected Mice. J. Vis. Exp. (112), e54138, doi:10.3791/54138 (2016). Regulatory T (Treg) cells, which express Foxp3 as a transcription factor, are subsets of CD4+ T cells. Treg cells play crucial roles in immune tolerance and homeostasis maintenance by regulating the immune response. The primary role of Treg cells is to suppress the proliferation of effector T (Teff) cells and the production of cytokines such as IFN-γ, TNF-α, and IL-2. It has been demonstrated that Treg cells' ability to inhibit the function of Teff cells is enhanced during persistent pathogen infection and cancer development. To clarify the function of Treg cells under resting or inflamed conditions, a variety of in vitro suppression assays using mouse or human Treg cells have been devised. The main aim of this study is to develop a method to compare the differences in phenotype and suppressive function between resting and activated Treg cells. To isolate activated Treg cells, mice were infected with lymphocytic choriomeningitis virus (LCMV) clone 13 (CL13), a chronic strain of LCMV. Treg cells isolated from the spleen of LCMV CL13-infected mice exhibited both the activated phenotype and enhanced suppressive activity compared with resting Treg cells isolated from naïve mice. Here, we describe the basic protocol for ex vivo phenotype analysis to distinguish activated Treg cells from resting Treg cells. Furthermore, we describe a protocol for the measurement of the suppressive activity of fully activated Treg cells. Regulatory T (Treg) cells express forkhead box P3 (Foxp3) as a transcription factor for their development and function1. Additionally, Treg cells express various other molecules such as CD252, lymphocyte-activation gene 3 (LAG-3)3, glucocorticoid-induced tumor necrosis factor receptor4, and cytotoxic T-lymphocyte-associated protein 4 (CTLA-4)5 on their surface or intracellular region. During chronic infection with various kinds of pathogens such as viruses6,7, bacteria8,9, and parasites10-12, or in the course of cancer development13,14, Treg cells become differentiated into activated cells, displaying enhanced suppressive function targeting effector CD4+ and CD8+ T cells. A number of papers have suggested that expanded and activated Treg cells contribute to the impaired CD8+ T cell response during friend retrovirus (FV) infection15-17. FV-induced Treg cells inhibit IFN-γ or granzyme B expression and cytotoxic reactivity of CD8+ T cells15-17. Moreover, in a herpes simplex virus infection model, it was reported that depletion of CD4+CD25+ Treg cells resulted in expansion of virus-specific CD8+ T cells and severe tissue damage by infiltration of immunopathogenic CD4+ T cells18-20. Mice infected chronically with the clone 13 strain of lymphocytic choriomeningitis virus (LCMV CL13)21-24 have been widely used to characterize the phenotype and function of effector T cells (Teff) and Treg cells during chronic virus infection. During persistent LCMV infection, virus-specific Teff cells progressively lose their effector function and become exhausted T (Texh) cells. On the other hand, Treg cells reinforce their ability to suppress virus-specific T cell response25. The decrease in the functioning capacity of the Teff cells can be explained by several factors such as upregulation of inhibitory receptors on Teff cells, altered function of antigen-presenting cells, production of immunoregulatory cytokines, and increased frequency or enhanced function of Treg cells26. Among the factors involved in T cell suppression, programmed cell death protein-1 (PD-1)-expressing Texh cells and Treg cells have been widely considered as the hallmarks of antigen persistence and suppressive environment. Recently, it was reported that blockade of the PD-1 pathway and ablation of Treg cells lead to enhanced T cell function and decreased viral load during LCMV chronic infection27. Furthermore, Treg cells are activated during chronic infection of mice with LCMV23,25 and their suppressive function is strengthened25. PD-1 is highly expressed on Treg cells as well as Texh cells, and the level of PD-1 expressed by Treg cells correlates with the strength of their suppressive function to inhibit T cell proliferation25. Here, we describe a method to compare the characteristics of activated Treg cells isolated from mice infected with LCMV CL13 and resting Treg cells isolated from naïve mice. Furthermore, we explain a series of processes to separate activated Treg cells and examine their ex vivo phenotype, as well as measure their suppressive activity in vitro. In this study, mice were maintained in a specific pathogen-free facility of the Yonsei Laboratory Animal Research Center of Yonsei University. All animal experiments were conducted in accordance with the Korean Food and Drug Administration guidelines using protocols approved by the International Animal Care and Use Committee of the Yonsei Laboratory Animal Research Center at Yonsei University. Prepare complete RPMI media. To RPMI media add 10% of FBS, 1% of penicillin-streptomycin, 1% of L-glutamine, and 50 μM 2-mercaptoethanol. Prepare fluorescence activated cell sorting (FACS) buffer. To do so, supplement phosphate-buffered saline (PBS) with 2% of FBS. Prepare T cell isolation buffer. To do so, supplement PBS with 2% of FBS and 2 mM ethylenediaminetetraacetic acid. Remove the spleens from naïve or LCMV CL13-infected mice as described previously19 and place them in 60 mm x 15 mm Petri dishes containing 10 ml of 2% RPMI media. NOTE: In this study experiments, 5 to 6 week-old C57B1L/6J female mice received 2 x 106 plaque-forming units (p.f.u.) of LCMV CL13 through intravenous injection via the tail vein. Sacrifice the mice at day 16 post-infection (16 d p.i.)25. Analyze ge-matched naive mice were on the same day. Place a cell strainer into a 50 ml tube and rinse it with 2 ml of 2% RPMI media. Place the spleen on the 70 μm cell strainer and grind using the plunger of a syringe. Rinse the cell strainer with 2 ml of 2% RPMI media and remove it from the 50 ml tube. Fill up the tube with 2% RPMI media and centrifuge at 300 x g for 5 min at 4 °C. Discard the supernatant and resuspend the cell pellet in 1 ml of ACK lysing buffer. Incubate the samples at room temperature (RT) for 5 min. NOTE: The volume of ACK lysing buffer indicated above is for one spleen. Scale up the volume accordingly for pooled spleen samples. Fill up the tube with 2% RPMI media and centrifuge at 300 x g for 10 min at 4 °C. Discard the supernatant and resuspend the cells at a density of 1 x 107 cells/ml in complete RPMI media. NOTE: For live cell counting, stain cells with trypan blue and count only live cells that are not stained using hemocytometer. NOTE: Before Treg cell isolation, examine the phenotype of splenic lymphocytes isolated from naïve or infected mice by staining the cells with various antibodies and analyzing them by flow cytometry. Transfer 50 μl of the cells (5 x 105 cells) among total splenic lymphocytes into each well of a new u-bottom 96-well plate and add 150 μl of FACS buffer per well. Centrifuge at 300 x g for 2 min at 4 °C. Discard the supernatant. Agitate the cell pellet and add 200 μl of FACS buffer per well. Centrifuge at 300 x g for 2 min at 4 °C (2 times). Prepare the antibody cocktail for staining cell surface markers in 50 μl of FACS buffer per well with the following antibodies and reagents. Anti-CD4 violet dye, Anti-CD25 green dye, Anti-PD-1 violet dye, Anti-CD8 PerCP-Cy5.5 dye and cell viability detection reagent near-infrared (IR) fluorescent reactive dye. NOTE: To further analyze the phenotype of activated Treg cells, anti-CD10323,25 can be added for cell surface-marker staining. Resuspend the cell pellet with 50 μl of antibody cocktail per well. Incubate for 20 min in the dark at 4 °C. Wash the cells twice with FACS buffer by centrifugation at 300 x g for 2 min at 4 °C. After the final washing step, decant the supernatant and fix the cells for 20 min in the dark at 4 °C with 100 μl of fixation buffer prepared according to the manufacturer's protocol. Wash the cells twice with the permeabilization wash buffer (prepared according to manufacturer's protocol) by centrifugation at 300 x g for 2 min at 4 °C. Prepare the antibody solution for intracellular Foxp3 staining, and resuspend the cell pellet with 50 μl of Anti-Foxp3 antibody solution. NOTE: To further analyze the phenotypes of Tconv and Treg cells, anti-CTLA can be added at this step. Incubate for 20 min in the dark at 4 °C and repeat Step 3.6. After the final washing step, resuspend the cell pellet in 200 μl of FACS buffer and examine the phenotype of the cells by flow cytometer25. Gate the live cell population. To analyze the phenotypes of Tconv cells during LCMV CL13 infection, examine the frequency of Foxp3-PD-1+ cells among CD4+ or CD8+ T cells. NOTE: Based on experimental results, the percentage of Foxp3-PD-1+ is more than 50% in both CD4+ and CD8+ T cell populations at 16 d p.i. with LCMV CL13. To analyze the frequency and phenotypes of Treg cells, examine the frequencies of Foxp3+ or Foxp3+PD-1+ cells among CD4+ T cells. NOTE: Based on experimental results, the percentage of Foxp3+ or Foxp3+PD-1+ cells is more than 20% in CD4+ T cell population, respectively. NOTE: The volumes of all reagents indicated below are for a starting cell number of 1 x 107 total splenocytes. Prepare the cells as described in section 2 using naive and LCMV chronically infected mice. Wash the cells by adding 10 ml of T cell isolation buffer. Centrifuge at 300 x g for 10 min at 4 °C. Discard the supernatant completely and resuspend the cell pellet in 40 μl of buffer. For CD4+ T cell enrichment using the magnetic cell separation system, add 10 μl of biotin-antibody cocktail and mix well. Incubate for 10 min at 4 °C. Add 30 μl of buffer, 20 μl of anti-biotin micro-beads for labeling of non-CD4+ T cells and 10 μl of CD25-PE antibody for fluorescent labeling of CD25+ cells. Mix well and incubate for 15 min in the dark. Add 2 ml of buffer and pass the cells through a 40 μm cell strainer into a new 50 ml tube to remove cell debris. Wash the cells by centrifugation at 300 x g for 10 min at 4 °C. Discard the supernatant completely and resuspend the cell pellet in 500 μl buffer at a density of up to 1.25 x 108 cells. Apply the cells onto the column and collect the unlabeled cells that pass through the column. Wash the column by adding 2 ml of buffer and centrifuge at 300 x g for 10 min at 4 °C. Discard the supernatant completely and resuspend the isolated CD4+ T cells in 90 μl of buffer. For magnetic labeling of CD25+ cells, add 10 μl of anti-PE microbeads, mix well, and incubate for 15 min in the dark at 4 °C. Add 2 ml of buffer and wash the cells by centrifugation at 300 x g for 10 min at 4 °C. Discard the supernatant completely and resuspend the cell pellet in 500 μl of buffer at a density of up to 1 x 108 cells. To enrich the CD4+CD25+ Treg cells, apply the cells onto the column for positive selection, and wash the column by adding 2 ml of buffer. Repeat the wash three times. When the column is empty after the final washing step, add 1 ml of buffer onto the column, and flush out the magnetically labeled CD4+CD25+ cells using the plunger. Repeat steps 4.8-4.9 to enhance the purity of the isolated CD4+CD25+ Treg cells. Wash the cells with FACS buffer by centrifugation at 300 x g for 10 min at 4 °C. Discard the supernatant and resuspend the isolated CD4+CD25+ Treg cells at a concentration of 2 x 106 cells/ml in complete RPMI media. To check the purity of the isolated-CD4+CD25+ Treg cells, use 2 x 105 cells from the total isolated-CD4+CD25+ Treg cells. Stain the cells with 50 μl of FACS buffer containing anti-CD4 FITC and cell viability detecting reagent near-IR fluorescent reactive dye. NOTE: CD25 was already labeled with PE during isolation. Incubate for 20 min in the dark at 4 °C. Wash the cells with FACS buffer by centrifugation at 300 x g for 2 min at 4 °C. After washing, resuspend the cell pellet in 100 μl of FACS buffer and check the purity by flow cytometry. Gate the live-cell population. To analyze the purity of Treg cells, confirm the percentage of CD4+CD25+ cells. NOTE: Based on experimental results, the percentage of CD4+CD25+ cells among purified cells is over about 80%. Prepare cells as described in section 2 using naïve mice. Wash the cells by adding 10 ml of T cell isolation buffer. Centrifuge at 300 x g for 10 min at 4 °C. Discard the supernatant completely, and resuspend the cell pellet in 40 μl of buffer. For CD8+ T cell isolation using the magnetic cell separation system, add 10 μl of biotin-antibody cocktail for non-CD8+ T cell labeling and mix well. Incubate for 5 min at 4 °C. Add 30 μl of buffer and 20 μl of anti-biotin microbeads. Mix well and incubate for 10 min at 4 °C. Apply the cells onto the column and collect the unlabeled cells that pass through the column. Wash the column by adding 2 ml of buffer three times. Centrifuge at 300 x g for 10 min at 4 °C. Discard the supernatant completely and resuspend the isolated CD8+ T cells in 2 ml of buffer. To check the purity of the isolated cells, prepare 50 μl of antibody solution in FACS buffer. Resuspend the 2 x 105 cells among isolated CD8+ T cells in 50 μl of antibody solution. NOTE: To prepare antibody solution, add anti-CD8 FITC, and cell viability detection reagent (near-IR fluorescent reactive dye) into FACS buffer. Incubate for 20 min in the dark at 4 °C. Wash the cells with FACS buffer by centrifugation at 300 x g for 2 min at 4 °C. After washing, resuspend the cell pellet in 100 μl of FACS buffer, and check the purity of the cells by flow cytometry. Gate the live-cell population. To check the purity of CD8+ T cells, confirm the percentage of CD8+ T cells. NOTE: Based on experimental results, the percentage of CD8+ cells among purified cells is over about 90%. Add PBS to the isolated CD8+ T cells. Centrifuge at 300 x g for 10 min at 4 °C. Discard the supernatant. Resuspend the isolated CD8+ T cells at a concentration of 1 x 107 cells/ml in PBS. To label the CD8+ T cells for the in vitro suppression assay, dilute cell proliferation tracking violet dye in PBS to obtain a concentration of 5 μM at RT. NOTE: The approximate excitation and emission peaks of the cell proliferation tracking violet dye used in the study are 405 and 450 nm, respectively. Mix well equal volumes of cell proliferation tracking violet dye (5 μM) and cell suspension (1 x 107 cells/ml of CD8+ T cells) in a 15 ml tube, and incubate at 20 min at 37 °C. Vortex the tube every 10 min. Fill up the tube with cold complete RPMI media, and leave the tube for 10 min at RT. Centrifuge at 300 x g for 10 min at RT. Discard the supernatant completely, and resuspend the cells at a concentration of 2 x 106 cells/ml with pre-warmed complete RPMI media. Incubate the cells for 15 min at RT. To prepare anti-CD3/CD28-coated beads, transfer the appropriate volume of magnetic beads to a 15 ml of tube (2.5 μl/1 x 105 cells). Add an equal volume of PBS and mix. Wash by centrifugation at 300 x g for 2 min at 4 °C and discard the supernatant. Dilute the magnetic beads in complete media (50 μl/well). Aliquot 50 μl of CD4+CD25+ Treg cells per well of u-bottom 96-well plate (1 x 105 cells/well). Add 50 μl of CD8+ T cells as responder T (Tresp) cells per well (1 x 105 cells/well). Add 50 μl of diluted anti-CD3/CD28-coated beads into per well. NOTE: In this step, label and set up control wells as follows: "unstimulated CD8+ T cell only" with no anti-CD3/CD28-coated beads; "CD8+ T cell only" with anti-CD3/CD28-coated beads; "CD8+ T cell only" with anti-CD3/CD28-coated beads; "Treg cell only" with anti-CD3/CD28-coated beads. Treg cells can be diluted by complete media and co-cultured with Tresp cells in a different ratio of Tresp cells:Treg cells (1:0.25-1:1). Add 50 μl or appropriate volume of media into all wells to total volume of 200 μl. Cover the plate with foil and incubate in a CO2 incubator at 37 °C for 72 hr. For the cytokine production analysis, after 3 days of culture, separate the supernatant of each well into another plate and perform enzyme-linked immunosorbent assay (ELISA). NOTE: The supernatant may be aliquoted and stored at -70 °C. In this experiment, anti-mouse IFN-γ antibody-coated plate was used to detect IFN-γ production according to the manufacturer s protocol. To determine IFN-γ production of proliferating CD8+ T cells on a single cell level, intracellular cytokine staining can be performed. After separating the supernatant from each well, wash the plate containing the cells with FACS buffer and centrifuge at 300 x g for 2 min at 4 °C (3 times). After washing, discard the supernatant. Resuspend the cell pellet with 50 μl of antibody cocktail for staining of proliferated CD8+ T cells. Incubate for 20 min in the dark at 4 °C. NOTE: To prepare antibody cocktail, add anti-CD4 FITC, anti-CD8 PerCP-Cy5.5, and cell viability detection reagent (near-IR fluorescent reactive dye) into FACS buffer. NOTE: Antibodies against various markers such as CD44 or CD69 can be combined with other antibodies to confirm activation of CD8+ T cells. Remember that CD8+ T cells have already been labeled with cell proliferation tracking violet dye at Step 5.10. Wash twice by centrifugation at 300 x g for 2 min at 4 °C. After the final washing step, discard the supernatant, and fix the cells for 20 min in the dark at 4 °C with 100 μl of fixation buffer. Wash twice by centrifugation at 300 x g for 2 min at 4 °C. Resuspend the cells with 200 μl of FACS buffer and measure the proliferation of cell proliferation tracking violet dye-labeled CD8+ T cells by flow cytometry. Gate the CD8+ T cell population among the live cells. Measure the percentages of divided and undivided cells according to the dilution of the cell proliferation tracking violet dye and CD8+ T cell dilution according to the following equation. % Inhibition = [(% of proliferated CD8+ T cells in the absence of Treg cells - % of proliferated CD8+ T cells in the presence of Treg cells)/(% of proliferated CD8+ T cells in the absence of Treg cells)] x 100. Further analyze the data by using the flow cytometry software25. We generated mice with persistent virus infection by injecting them with 2 x 106 p.f.u. of LCMV CL13 intravenously. To investigate the phenotypic changes in Treg cells and Tconv cells during chronic virus infection, splenic lymphocytes obtained from naïve and infected mice were stained with various antibodies and analyzed by flow cytometry. At 16 d p.i., PD-1 was upregulated in both Foxp3-CD4+ Tconv (Figure 1A, upper panel) and Foxp3-CD8+ Tconv (Figure 1B, upper panel) cells. The frequency of Foxp3+CD4+ Treg cells was two times higher in the LCMV CL13-infected mice than in the naïve mice (Figure 1A). 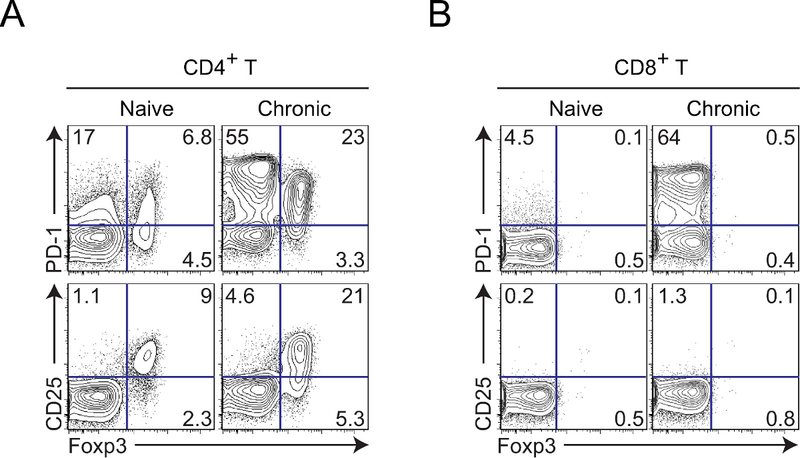 In particular, most of the Foxp3+CD4+ Treg cells displayed the activated phenotype, expressing high levels of PD-1 at this time point (Figure 1A). For the in vitro suppression assay, a considerable number of CD8+ Tconv cells and CD4+CD25+ Treg cells were required. To obtain 1 x 107 cell proliferation tracking violet dye-labeled CD8+ T cells, splenocytes from two spleens of naïve mice were pooled. To obtain 2 x 106 or 3 x 106 of CD4+CD25+ Treg cells, at least three spleens from naive and LCMV CL13-infected mice, respectively, were pooled. CD8+ T cells as Tresp cells were separated successfully without significant contamination with other immune cells (Figure 2A). Treg cells could also be isolated, with a dominant population of CD25+CD4+ T cells with more than 80% purity (Figure 2B). To compare the suppressive function of naïve and chronic Treg cells, the isolated Treg and Tresp cells were incubated together under stimulation with anti-CD3/CD28-coated beads at 37 °C for 3 days. % inhibition of CD8+ Tresp cell proliferation was increased in a Treg cell dese-dependent manner (Figure 3A). When CD8+ Tresp cells were co-cultured with chronic Treg cells in a ratio of 1:1, proliferation of CD8+ Tresp cells were significantly inhibited (Figure 3B). IFN-γ production by CD8+ Tresp cells were also significantly inhibited when CD8+ Tresp cells were co-cultured with activated Treg cells from chronically infected mice rather than with resting Treg cells from naïve mice in a Treg cell dose-dependent manner (Figure 3C). Figure 1: Phenotypes of CD4+ and CD8+ T cells in the spleen of naïve mice or LCMV CL13-infected mice at 16 d p.i. (A) Expression of PD-1 or CD25 on Foxp3-CD4+ Tconv and Foxp3+CD4+ Treg cells. (B) Expression of PD-1 or CD25 on Foxp3-CD8+ Tconv cells. Splenic lymphocytes were stained with antibodies against CD4, CD8, CD25, PD-1, and Foxp3. Data are representative of three independent experiments. Panel A has been modified from25 as a reference. Please click here to view a larger version of this figure. Figure 2: Purities of Tresp cells isolated from naïve mice and Treg cells isolated from naïve or LCMV CL13-infected mice. (A) Percentage of CD8+ T cells after isolation. (B) Percentage of CD25-expressing CD4+ Treg cells after isolation. Each quadrant in (B) was determined by the expression levels of CD4 and CD25. Data are representative of three independent experiments. Please click here to view a larger version of this figure. Figure 3: Effect of activated Treg cells on CD8+ T cell response. (A) % inhibition of CD8+ T cells co-cultured with Treg cells in a Treg cell dose-dependent manner. (B) Proliferation of CD8+ T cells co-cultured with Treg cells in 1:1 ratio. (C) IFN-γ production of CD8+ T cells co-cultured with Treg cells in a Treg cell dose-dependent manner. Proliferation of CD8+ T cells was measured by dilution of cell proliferation tracking violet dye in proliferated CD8+ T cells and IFN-γ secretion was evaluated by ELISA. Cell proliferation tracking violet dye-labeled CD8+ T cells were stimulated with anti-CD3/CD28-coated beads for 3 days in the absence or presence of Treg cells isolated from either naïve or chronically infected mice. In the histogram, the numbers without and with parenthesis indicate the proliferation percentage of CD8+ T cells co-cultured with and without Treg cells, respectively. Filled gray peaks in the histogram indicate proliferation of CD8+ T cells co-cultured without Treg cells. Each group was designed in triplicates. The bars represent mean + SEM. This figure has been modified from25 as a reference. Please click here to view a larger version of this figure. Although only a small number of Treg cells exist in mice and humans, it is important to understand their function as they play a crucial role in regulating the immune response and maintaining immune tolerance. The number and suppressive functions of Treg cells increases during a chronic virus infection15-20 as well as cancer progression13,14. This is probably due to continued antigen stimulation. To evaluate the Treg cells function under antigen persistence and disease development, their suppressive activity needs to be measured. Here, we describe a protocol to analyze the ex vivo phenotype of Treg cells and measure their suppressive activity using an in vitro co-culture system of CD8+ T cells and Treg cells. Critical steps in the current protocol are analysis and isolation of Treg cells. Live and freshly isolated Treg cells show clear suppressive activity in vitro. We also examined the phenotypes of Tconv and Treg cells during a chronic virus infection. Tconv cells, i.e., Foxp3-CD4+ and CD8+ T cells showed a decrease in cellular activity after the chronic virus infection (Figure 1). The PD-1 expression was upregulated in both the Tconv cell populations. Increase in Treg cell number and up-regulation of PD-1 expression are the hallmarks of immune response during a chronic virus infection. Additionally, anti-bodies for other inhibitory receptors such as TIM-3 and CTLA-4 can be used in combination with PD-1 to examine the T cell phenotype by FACS after choric virus infection. In order to investigate the suppressive activity, Tresp cells and Treg cells were co-cultured at a ratio of 1 to 1. Co-culture with Treg cells from chronically infected mice significantly reduced CD8+ T cell proliferation and IFN-γ secretion when compared to Treg cells from naïve mice. This implies that the proliferation and cytokine production of CD8+ T cells co-cultured with Treg cells are inversely related to the suppressive function of Treg cells. Although this protocol recommends the use of a magnetic cell separation system for Treg cell isolation, contamination with non-Treg cells cannot be ruled out. The Treg cells obtained from Foxp3-GFP reporter mice28-30 are better candidates to accurately investigate the function of Treg cells than magnetic cell separation system, as CD25 is often overexpressed on activated CD4+ Tconv as well as Treg cells. The suppressive function of Treg cells has been evaluated by various in vitro suppression assays16,28,31-34. The advantage of the in vitro suppression assay is that it evaluates the direct effect of Treg cells on the inhibition of the CD8+ T cell response, because only Tresp cells are co-cultured with Treg cells. In addition to CD8+ T cells, the CD25-CD4+ T cells can be used instead of Tresp cells25. The effects of Treg or Tconv cells on immune cells such as dendritic cells or natural killer cells can be evaluated by varying the experimental conditions. Molecules such as the CD10335, LAG-336, glycoprotein A repetitions predominant37, CD4338, CD11a38, or killer cell lectin-like receptor subfamily G member 138 have been used as markers of activated Treg cells in specific diseases. In this protocol, we used PD-1 as an indicator to identify activated Treg cells during chronic virus infection. This protocol can be used for multifaceted analyses (phenotypic and functional) of Treg cells under specific conditions. S.-J.H. has a patent and receives patent royalties related to the PD-1 pathway. The other authors have no financial conflicts of interest. This work was supported by Basic Science Research Program through the National Research Foundation of Korea (NRF) funded by the Ministry of Education (2015R1A6A3A01020610 to HJP) and a grant from the Korean Health Technology R&D Project, Ministry for Health, Welfare and Family Affairs, Republic of Korea (HI15C0493 to SJH). Hori, S., Nomura, T., Sakaguchi, S. Control of regulatory T cell development by the transcription factor Foxp3. Science. 299, (5609), 1057-1061 (2003). Sakaguchi, S., Sakaguchi, N., Asano, M., Itoh, M., Toda, M. Immunologic self-tolerance maintained by activated T cells expressing IL-2 receptor alpha-chains (CD25). Breakdown of a single mechanism of self-tolerance causes various autoimmune diseases. J Immunol. 155, (3), 1151-1164 (1995). Huang, C. T., et al. Role of LAG-3 in regulatory T cells. Immunity. 21, (4), 503-513 (2004). McHugh, R. S., et al. CD4(+)CD25(+) immunoregulatory T cells: gene expression analysis reveals a functional role for the glucocorticoid-induced TNF receptor. Immunity. 16, (2), 311-323 (2002). Takahashi, T., et al. Immunologic self-tolerance maintained by CD25(+)CD4(+) regulatory T cells constitutively expressing cytotoxic T lymphocyte-associated antigen 4. J Exp Med. 192, (2), 303-310 (2000). Manigold, T., et al. Foxp3+CD4+CD25+ T cells control virus-specific memory T cells in chimpanzees that recovered from hepatitis. C. Blood. 107, (11), 4424-4432 (2006). Andersson, J., et al. The prevalence of regulatory T cells in lymphoid tissue is correlated with viral load in HIV-infected patients. J Immunol. 174, (6), 3143-3147 (2005). Chen, X., et al. CD4(+)CD25(+)FoxP3(+) regulatory T cells suppress Mycobacterium tuberculosis immunity in patients with active disease. Clin Immunol. 123, (1), 50-59 (2007). Shafiani, S., Tucker-Heard, G., Kariyone, A., Takatsu, K., Urdahl, K. B. Pathogen-specific regulatory T cells delay the arrival of effector T cells in the lung during early tuberculosis. J Exp Med. 207, (7), 1409-1420 (2010). Belkaid, Y., Piccirillo, C. A., Mendez, S., Shevach, E. M., Sacks, D. L. CD4+CD25+ regulatory T cells control Leishmania major persistence and immunity. Nature. 420, (6915), 502-507 (2002). Grainger, J. R., et al. Helminth secretions induce de novo T cell Foxp3 expression and regulatory function through the TGF-beta pathway. J Exp Med. 207, (11), 2331-2341 (2010). cells in helminth infection: the regulators and the regulated. Trends Immunol. Taylor, M. D., van der Werf, N., Maizels, R. M. 33, (4), 181-189 (2012). You, Z. Tumor regulatory T cells potently abrogate antitumor immunity. J Immunol. 182, (10), 6160-6167 (2009). Dittmer, U., et al. Functional impairment of CD8(+) T cells by regulatory T cells during persistent retroviral infection. Immunity. 20, (3), 293-303 (2004). Robertson, S. J., Messer, R. J., Carmody, A. B., Hasenkrug, K. J. In vitro suppression of CD8+ T cell function by Friend virus-induced regulatory T cells. J Immunol. 176, (6), 3342-3349 (2006). Iwashiro, M., et al. Immunosuppression by CD4+ regulatory T cells induced by chronic retroviral infection. Proc Natl Acad Sci U S A. 98, (16), 9226-9230 (2001). Suvas, S., Kumaraguru, U., Pack, C. D., Lee, S., Rouse, B. T. CD4+CD25+ T cells regulate virus-specific primary and memory CD8+ T cell responses. J Exp Med. 198, (6), 889-901 (2003). Suvas, S., Azkur, A. K., Kim, B. S., Kumaraguru, U., Rouse, B. T. CD4+CD25+ regulatory T cells control the severity of viral immunoinflammatory lesions. J Immunol. 172, (7), 4123-4132 (2004). Veiga-Parga, T., et al. On the role of regulatory T cells during viral-induced inflammatory lesions. J Immunol. 189, (12), 5924-5933 (2012). Wherry, E. J., et al. Molecular signature of CD8+ T cell exhaustion during chronic viral infection. Immunity. 27, (4), 670-684 (2007). Jin, H. T., et al. Cooperation of Tim-3 and PD-1 in CD8 T-cell exhaustion during chronic viral infection. Proc Natl Acad Sci U S A. 107, (33), 14733-14738 (2010). Punkosdy, G. A., et al. Regulatory T-cell expansion during chronic viral infection is dependent on endogenous retroviral superantigens. Proc Natl Acad Sci U S A. 108, (9), 3677-3682 (2011). Blackburn, S. D., et al. Coregulation of CD8+ T cell exhaustion by multiple inhibitory receptors during chronic viral infection. Nat Immunol. 10, (1), 29-37 (2009). Park, H. J., et al. PD-1 upregulated on regulatory T cells during chronic virus infection enhances the suppression of CD8+ T cell immune response via the interaction with PD-L1 expressed on CD8+ T cells. J Immunol. 194, (12), 5801-5811 (2015). Virgin, H. W., Wherry, E. J., Ahmed, R. Redefining chronic viral infection. Cell. 138, (1), 30-50 (2009). Penaloza-MacMaster, P., et al. Interplay between regulatory T cells and PD-1 in modulating T cell exhaustion and viral control during chronic LCMV infection. J Exp Med. 211, (9), 1905-1918 (2014). Chang, M., et al. The ubiquitin ligase Peli1 negatively regulates T cell activation and prevents autoimmunity. Nat Immunol. 12, (10), 1002-1009 (2011). Krishnamoorthy, N., et al. Early infection with respiratory syncytial virus impairs regulatory T cell function and increases susceptibility to allergic asthma. Nat Med. 18, (10), 1525-1530 (2012). Yadav, M., et al. Neuropilin-1 distinguishes natural and inducible regulatory T cells among regulatory T cell subsets in vivo. J Exp Med. 209, (10), 1713-1722 (2012). Tai, X., et al. Basis of CTLA-4 function in regulatory and conventional CD4(+) T cells. Blood. 119, (22), 5155-5163 (2012). Rushbrook, S. M., et al. Regulatory T cells suppress in vitro proliferation of virus-specific CD8+ T cells during persistent hepatitis C virus infection. J Virol. 79, (12), 7852-7859 (2005). Sekiya, T., et al. The nuclear orphan receptor Nr4a2 induces Foxp3 and regulates differentiation of CD4. T cells. Nat Commun. 2, (269), (2011). Merianos, D. J., et al. Maternal alloantibodies induce a postnatal immune response that limits engraftment following in utero hematopoietic cell transplantation in mice. J Clin Invest. 119, (9), 2590-2600 (2009). Allakhverdi, Z., et al. Expression of CD103 identifies human regulatory T-cell subsets. J Allergy Clin Immunol. 118, (6), 1342-1349 (2006). Camisaschi, C., et al. LAG-3 expression defines a subset of CD4(+)CD25(high)Foxp3(+) regulatory T cells that are expanded at tumor sites. J Immunol. 184, (11), 6545-6551 (2010). Wang, R., et al. Expression of GARP selectively identifies activated human FOXP3+ regulatory T cells. Proc Natl Acad Sci U S A. 106, (32), 13439-13444 (2009). Myers, L., et al. IL-2-independent and TNF-alpha-dependent expansion of Vbeta5+ natural regulatory T cells during retrovirus infection. J Immunol. 190, (11), 5485-5495 (2013).